Pictured is a matte maroon ornament with metallic gold ink, AA border and Murry Hill typeset. The 2-5/8" diameter glass Christmas ornaments are custom printed. 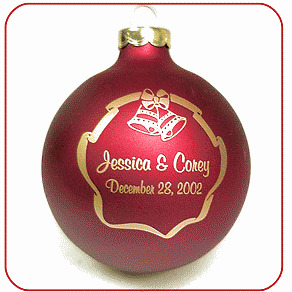 We imprint the bride and groom's name and the wedding date onto many customizable ornament and ink colors. Shipping takes place 2 weeks from order receipt. THESE TAKE 2-3 WEEKS TO PRODUCE!! !